Need to comply quickly, easily and on a budget? We can help. The deadline to comply with ASC 606 and IFRS 15 has passed but many companies are still struggling with complex reporting. Some companies believe that a purpose- built solution for complying with the new revenue accounting rules is not easily available and implementing can be complex for some scenarios. They feel a solution like SAP RAR is too complicated and will take too much time to implement. Others have chosen to use “brute force” solutions such as spreadsheets or alleged cloud solutions that integrate with their ERP only to find it just doesn’t work. But why? If you have relatively straight forward sales structures and simplistic multi-element arrangements you still want a solution that is scalable, automated and meets the scrutiny of the auditors. Bramasol has developed a RevRec Ready Rapid Compliance Solution for the organizations like yours to help you get ASC 606 & IFRS 15 compliant on a fast track and in a very cost-effective manner. 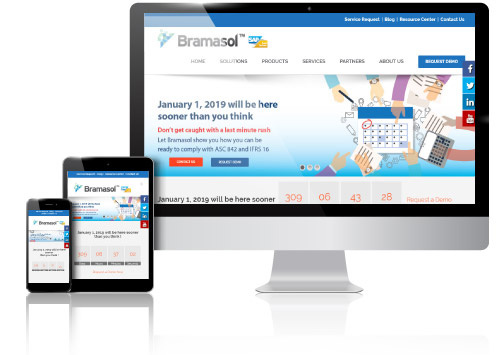 It leverages the power of the industry’s leading RevRec solution, SAP RAR, and combines it with Bramasol’s deep experience to provide a quick start that can get you up and running in weeks instead of months or years and for a price that you can afford.